From the violent halls of the Brobnar we venture to the laboratories of our fifth house. The genius (and most assuredly insane) scientists of House Logos! Also known as the Society of Logic and Reason, House Logos is the network of intellectuals and scholars who are dedicated to the advancement of scientific knowledge and the pursuit of the secrets of the Crucible. Logos deems itself the foremost authority of intellectual development on Crucible, and could not stand further apart from the more chaotic houses of Brobnar, Dis, and Untamed. However, in their pursuit of knowledge, House Logos has thrown restraint to the wind, and is willing to pursue any experiment no matter how ethically questionable, even if it is at the expense of the lives of others. Ethics is something they eschew in favour for the march of scientific progress. If you wanted a conscience any Logotarian would likely recommend you to go visit Sanctum. That being said, Logos is happy to welcome any species among their colleagues. Ironically, it is in this that they are most like the cosmopolitan Brobnar. Eventually, however, many members of Logos end up looking the same once they begin their inevitable transformation into cyborgs. Limb by limb, organ by organ, many Logotarians replace their parts with machines in order to shake off the mortal frailties of the flesh so that they might be able to pursue their research without the inconvenience of dying. In fact, the use of cybernetics has become so normalized in House Logos that there are none who remember what the original Logotarians looked like. Ever on the verge of developing new tech, Logos technology is highly experimental, always pushing the bounds of possibility, even harnassing æmber to power their machines. However, Logos tech can be as unstable as it is cutting edge, and sometimes has unexpected…side-effects that cannot always be accounted for, thus making the faction that is most dedicated to the precision of logic also one of the most unpredictable. Also they have robocats (I really can’t understate how important this is). Logos society is split primarily into two groups of thinkers: the Theorists and the Mechanists. The Theorists focus on the theoretical, and obsessively refine theories and postulate hypotheses in their attempts to unravel the secrets of the universe. The Mechanists, on the other hand, meticulously collect empirical data, focusing on the practical applications of their experiments. As fitting for a faction of haughty scientists, both the Theorists and Mechanists view themselves as the intellectual superior (which somehow brings to mind the endless bickering of Sheldon and Howard from The Big Bang Theory). Interested in discovering the mysteries of the Crucible, it is no wonder that the minds of Logos find themselves attracted to the equally enigmatic archons. Allying oneself to the archons also presents a unique opportunity to study the mysterious demi-gods, many among the Logos would think it foolish to relinquish. Likewise, many archons find the knowledge the Logos have at their disposal to be invaluable, and many archons are curious to know more about themselves. As one can imagine, the geniuses of House Logos employ a focused strategy when they play. Instead of focusing on aggression, or raw æmber gain, Logos is best at expanding your options by allowing you to draw more cards and by archiving cards from your hand or other places for later use. They are primarily a House for thinkers who want to consider what they play and when they want to play it. But that is not all that they are good at, oh dear no. They are also unpredictable, and as mad scientists they can cause indiscriminate destruction across the field. Logos likes options. They like options a lot. And endeavour to provide them with the sheer amount of cards that let them draw. Of the Houses, they are the most dedicated to filling up your hand during your turn, and have the vaunted Library Access among the many creatures and artifacts that let them draw. This works in your favour because it allows you to play more cards if they happen to be Logos, or otherwise let you fill up your hand beyond the 6 cards you normally get at the end of the turn. Their draw power also helps mitigate the drawbacks of any chains you may have accumulated over the course of the game or even during the course of competitive season now that chain-bound events are starting up. Even for the cards that you cannot typically play, Logos can help you with the likes of Phase-Shift. At the end of the day, Logos is capable of some very big plays depending on the cards you’re able to pull forth from your deck. So now you’ve drawn a bunch, but you have cards you don’t want to play immediately. Logos can help you with that as well, by archiving! Archiving lets you take cards from your hand (or sometimes other places) and put them in your Archive pile which you can pick up on later turns after you’ve chosen your active House for that turn. This allows a major flexibility in planning your long-term strategy for the game, saving cards that aren’t immediately useful now but can be devestating later. And since Archived cards are out of your hand, it will free up valuable space to let you draw more cards at the end of your turn. Just like their ability to draw, Logos has the highest concentration of cards that allow you to Archive. Also with cards like Knowledge is Power (or Dysania if you’re going after your opponent), you can harnass the power of archiving to generate æmber for your cause. While they like to hoard knowledge, Logos also loves to experiment on things which sometimes results in some good old fashioned indiscriminate destruction. While Brobnar loves to kill things by fighting them, and Dis reign as demon kings in destroying things outright, Logos also (somewhat surprisingly) throws their hat in the ring for the capacity of blowing everything up on the field. 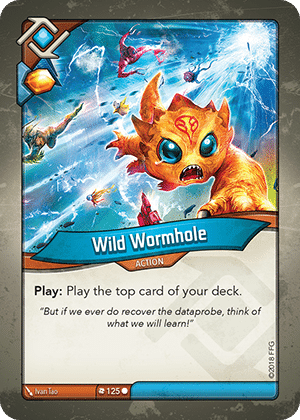 Cards like Bouncing Deathquark, Crazy Killing Machine, Strange Gizmo, andNeutron Shark get the job done, but typically target your board as well as the opponents. Although Dis does have more options to destroy creatures, Logos is able to target artifacts more often than Dis can, which gives them a slight edge. No one is safe when an experiment goes awry! I am saddened to say that of all the Houses in all my decks, Logos has only ever cropped up once or twice. Therefore my personal experience with them is the most limited. That being said, I have a few cards that have stood out as clear favorites that I want to talk about. I feel like it would be an insult to not include Library Access. In the Keyforge community Library Access has almost become its own archetype. And I can understand why. The ability to draw a card each time you play another card can result in some savage plays. If you happen to have a lot of Logos cards ready in your hand you’ll be able to instantly fill your hand as you play. Better yet, if you end up playing cards that let you draw you’ll be able to fill your hand past 6 and prepare for devestating future turns. Watch out for Dis’s Ember Imp though, since it is a great counter to Library Access if you don’t get it off the field first. If I had one complaint about Logos, is that it doesn’t do too much with æmber. 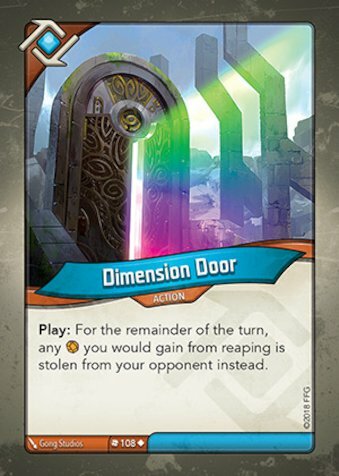 Hence Dimension Door is my favorite card from Logos because it lets the mad scientists turn into extra-dimenisonal thieves. This can be a very powerful card, since you will also get your Reap effects from your creatures (where most Shadows creatures either have to use an Action or Fight in order to steal). It is hampered by your opponent’s æmber pool however, since once they run out any other creature you use to Reap won’t generate æmber so be careful for that, but this card can easily turn the tide of a game if played properly! This card may not be the most prominent in the Logos line up, but holds a special place in my heart for no other reason than I love the sheer versatility of it. Being able to fetch any card from my discard pile is great, and reminds me of Untamed’s Nepenthe Seed. However, Novu Archaeologist has a leg up on the seed because they (it’s a cyborg so I don’t know if it has a gender) can consistently take cards from the discard pile and Archive them while Nepenthe Seed is a one time use. This lets me instantly get back any key cards I may need to win the game, and turns the discard pile to basically a buffet of new options. Everyone I talked to loves Logos. I can see why. I myself feel disheartened because I don’t have too much experience with them. I’ve always like robots and scientists, but for flavor they don’t do much beyond ‘quirky mad-scientist.’ Thankfully ‘quirky mad-scientist’ is hella fun, and I’ve always had plenty of fun when I play with them. Logos is what I consider a “support” House, in that it is very useful to have in a deck but it won’t be winning the game by their lonesome (something I feel Shadows and Untamed could very much do). All in all, this is the House I most look forward to (dare I say it?) experimenting with in the future! We’re coming reaching the end-stretch of our tour here folks! Next up we’ll take a jaunt down the shady alleys of House Shadows. Until then, keep forging Keyforgers!